Russia – China relations have reached a record level. Exchange visits between the countries and gestures of friendship have become the norm. Nevertheless, the great potential for economic and cultural cooperation remains unfulfilled. It manifests itself in protectionism, lack of mutual understanding, and irrational fears of people, being an obstacle for establishing economic and cultural ties on a long-term basis. 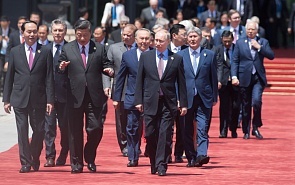 The interfacing the Silk Road Economic Belt (SREB) with Eurasian Economic Union (EEU), promoted by Chinese and Russian senior officials since 2015 and supported by the EEU members, will be a source of economic growth and a basis for reshaping the Eurasian space to maintain peace and security in the region. This joint report is the first collective research on Eurasian integration made by the elite think tanks from Russia, China, and Kazakhstan. It offers practical steps towards the adjoining the SREB and EEU and claims that many fears about such a process are groundless. Russia – China cooperation is not about politics and security only. It has to be economically based, complex and mutually beneficial. In the modern world, which is undergoing global changes, Russia and China are not rivals – they are partners that have had a high impact on peace and prosperity of Eurasia.